Greetings again from the darkness. All we need is one more miracle. Having been beatified with one “confirmed” miracle, it’s that missing second one that stands between Mother Teresa and Sainthood. 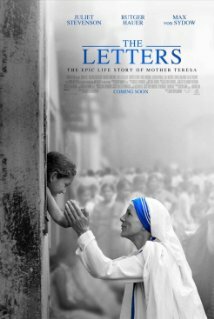 At times the film from director William Riead plays like a highlight reel for Mother Teresa’s induction into the Catholic Hall of Fame, as the dual emphasis is on all the good things she did for the poor, as well as the surprising sense of isolation and abandonment she felt most of her life. The film is structured in flashback form as a priest played by Rutger Hauer is charged with researching the case for canonizing the late Mother Teresa. He crosses paths with Father Celeste van Exem (Max von Sydow), who shares the saved correspondence from Mother Teresa that provides the title of the movie. These very personal letters spanned 50 years and act much as a journal of her work and emotions. Most of the movie takes us through the progression of Mother Teresa’s life. A slump-shouldered Juliet Stevenson portrays the nun as a woman on a mission from God … despite the obstacles from her detractors: jealous and disapproving nuns, many in the Catholic Church, and even some of the local citizens whom she desired to help. Her commitment to assist “the poorest of the poor” placed her in some tough situations and undesirable environments. She seemed to take on the suffering of those she was serving. Given her proclamation that “It’s God’s will, not mine”, the Vatican approved her plan to go outside the Loreto Order to serve the poor. Two years later, her application for a new order was approved, resulting in the congregation of The Missionaries of Charity. Her mission then had structure and backing, and so began to make real progress. Capturing the essence of this woman is what the film does best. We absolutely understand how she became “an icon of compassion for all religions” by giving “voice to the poor”. Perhaps, given the times we are in, this ability to serve multiple religions could itself by considered a miracle. As with any person who serves others, Mother Teresa had (and has) her detractors and critics. She (like her Catholic Church) opposed contraception … despite the needs within the community she served. Others accused her of mismanaging the millions in contributions, and spending too much effort recruiting new Catholics. Again, those accusations are not the purpose of the film, which instead profiles a woman who helped so many who otherwise would have been ignored in their misery. As a Nobel Peace Prize winner in 1979, her commitment to the cause resulted in her most public recognition and brought her full circle from an early line of dialogue: “I may not be wanted here, but I am needed.” Regardless of the Catholic rule book requirements, it’s difficult to imagine a modern day person more worthy of being considered a Saint. This entry was posted on Thursday, December 3rd, 2015 at 8:49 pm and is filed under Drama. You can follow any responses to this entry through the RSS 2.0 feed. You can leave a response, or trackback from your own site.